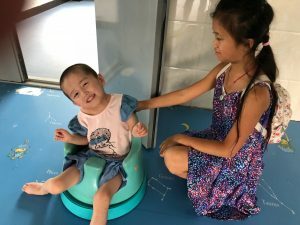 I just returned from China, where I visited the orphanage that we adopted my daughter from 9 years ago. It was a powerfully moving visit, mostly because my daughter, who is now 12 years old, got to realize a long standing dream of holding, playing with, and feeding the babies, just like she herself was once cared for by others. It came full circle, this giving back, and it made me weep to see her picking up a toddler who was crying, and seeing the baby quiet down instantly, just like it had been for her at that age. All these children needed was attention, and it was the one thing they were lacking. 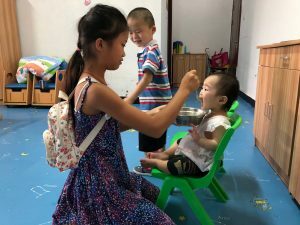 The story of the one-child policy and international adoption of hundreds of thousands of baby girls from China from the 1990s through the early 2000s is another story for another time. 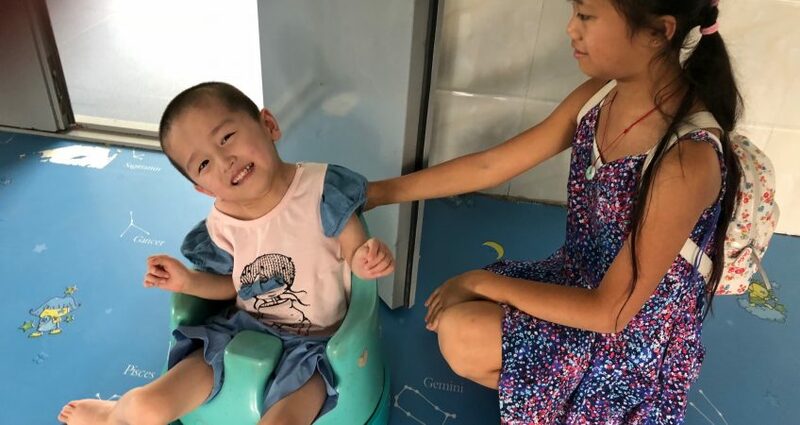 I could only adopt one, and now it is impossible to adopt a baby from China, as a foreigner, unless s/he has severe special or medical needs or is about to age out of the orphanage. To witness the healthy babies languishing in the Social Welfare Institute (as the orphanages are called) was unbearable. One baby was called “Little Little,” often babies in China have nicknames like this. (My own daughter was named “Healthy Healthy” when she was in the orphanage.) Little Little was just walking at age 1 and a half, and as she toddled, she cried to be picked up. My daughter was delighted to oblige and comfort her, and then to sit her in a chair and feed her. The baby sat and opened her mouth like a little bird as my child spooned the food in her mouth, the same spoon that would go in every mouth of every child that lined up for food, waiting oh so patiently. The moment the dish of food was gone, the caregiver scooped the baby up and put her back in the crib, where she’d been all afternoon. The baby instantly put her thumb in her mouth and self-soothed, drawing a blanket over her head. I couldn’t bear it, and I went over to see if she would interact with me. With delight, she played with my fingers, my rings and bracelets, like any baby, and smiled with a few tiny teeth when we played peek-a-boo. She stretched out her arms to be picked up and I couldn’t not, and we danced around the room like I had with my own child 9 years ago, and I saw the same little smile. “It’s time to go,” the orphanage director cautioned us, and I reluctantly returned Little Little to the crib, where she stood, torn between watching me and watching the giant TV screen animation that the caregiver switched on at that moment. 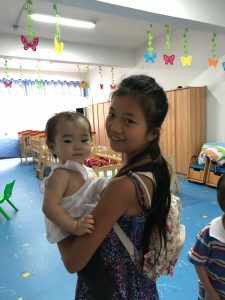 I asked repeated questions about the baby, if she could be adopted within China, if she could be sponsored (like my child had) by a charitable organization. The answers were not positive, and I left in tears, wishing I could do something, anything to help. 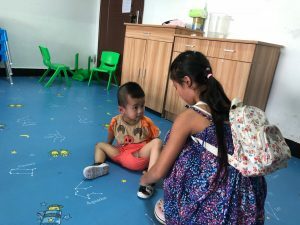 I asked a lot of questions when I got back to the United States, of adoption agency directors, of adoption guides, of nonprofits that sponsor Chinese orphanage children , both adoptable and unadoptable. There is not much I can do other than donate finances and clothing. I cannot save Little Little. All I can do from here is to wish her well. I wake in the morning thinking of her sleeping, I go to bed at night, thinking of her waking. And I wish her a family, a Chinese family, to come as soon as possible for her, and offer her a new name. There was another child who equally haunted me, but differently. We called him the Buddha Boy. He could not stand up. His legs were like thin rails, and he sat in a soft seat with wheels on the floor. He could push himself everywhere, and that he did. What caught me about him was his pure delight and glee, his laughter that over-spilled, and the tremendous light that radiated from his smile. If we played with him, he giggled with happiness. When my daughter tickled his head, he leaned back into her hands and shook with laughter. His energy lit up the entire room, and every other child who could respond, did so with equal happiness. He rolled around the floors and hallways with boundless joy. I was filled with awe to see this child who is 4 years old, and has less than nothing, and yet has everything. I wanted to put the one baby under my arm, and this little boy under my other arm, and duck out the door with them and speed away in a getaway car. When I returned home, I read that the Buddha is the protector of the poor, and I thought, this is a Buddha in human form, spreading light throughout the orphanage to children and caregivers alike. I am so grateful he is there, though I wish he could receive the care he needs. So I asked questions, about what else I could do, and I was told that most orphanage directors would never even have let us spend hours playing with the babies. Most orphanage visits don’t include interactions with the children. Why? Because they are going back to a situation of no stimulation, so better not to stimulate them. I couldn’t live with that answer. So what is the value of “comfort in the meantime?” I have asked this question often throughout the past few years as I work closely with vulnerable children. I believe strongly that my ability to offer lemonade and cookies to refugee children housed in shelters, who had crossed the border as unaccompanied minors, was just as important as filing their paperwork. They are children, and they need hugs and nurturing as much as any other child. They need education, medical care, emotional support, everything that all children need. Would we say they should just suffer until they are reunited with their families? I could never say that. I could never give them any less than I give any other child. I struggled with this idea too when my mother was in a nursing home, suffering from Alzheimer’s and Dementia and Parkinson’s, and I would visit her and wake her so she could know I was there. She would light up with a huge smile, and though she might not say my name, she knew it was me. She was so happy to see me. But by the time I had to go home, she was upset. She didn’t want me to leave, and of course I understood, but I had to go. I would set her in front of the television with the other residents, so that she wouldn’t be alone, and I always cried the whole way home, thinking, why did I visit her? Was I waking her up only to say goodbye? Was she happier sleeping? I don’t know the answer; I only know that my tendency is to do what might be the wrong thing, which is to interact, to offer whatever I can in the moment. Is it just to make me feel better? The Dalai Lama once said with a smile, that giving service is one of the most selfish things we can do, because it makes us feel good. But that doesn’t mean we shouldn’t do it, it just causes me to look at the question: Is it better not to do anything because you would be disturbing the routine of the child or the elderly person? Or is it better to let them know they are not forgotten? One moment this summer I was with children from Central Harlem, who I had taken out to a lake to sit and observe the natural world around us. They leaned against the boathouse and put their hands to their ears, so they could hear better. We call these “deer ears,” to amplify the sound. They sat for one minute in silence and counted how many different sounds they could hear: a bird, a frog, a waterfall… I always ask them to raise their hands to tell me one thing they heard, and a 7-year-old child turned to me, with a smile on her face that was larger than the sky, and said, “I heard nature!” And I thought to myself, that is important, that is enough, that is a comfort, for one child to have heard nature and to have recognized it – that is forever. The issue always is: Is it enough? Does it matter if one elderly man joins in singing with us, or are we just disrupting his routine? Are we interfering when we seek to help? Are we just returning children or the elderly or anyone we care about to a worse situation if we comfort them for a short while? So what do you think? Comfort in the meantime – does it do any harm? A beautiful, moving meditation on what we can do in a world that is often cruel. Comfort in the meantime seems like the right thing to do. The world is too cold otherwise.